Prelude: The concept for this post was provided by ReputationManagement.com, a leading provider of premier relationship services. Do you know what I give thanks for? It's that when I was in my teens and early twenties, I wasn't on Facebook. True, I did have my own website (talking about computer games and rave music - if anyone wants to experience my ancient and extremely poor game, "Ravers vs Peaceniks", I need something that can compile Visual Basic 3 code into something understandable by todays computers, do let me know if you have a solution) but that website has sunk virtually without trace, and I can proceed through life, unhindered. Today however people (including, but not exclusively, the young) have to be prepared that whatever they put online may be accessible for years afterwards. Put a cheeky selfie up about a few too many drinks? Or a long rant about an annoying customer at your current job? It might just be a bit of fun, but how would you feel if a potential recruiter viewed it? 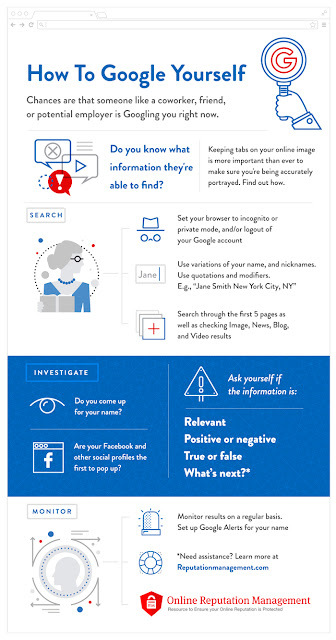 ReputationManagement.com have put together this infographic full of tips on Googling yourself and seeing what's out there. If you try this, do pop in the comments know what you found - was you surprised at what you found? From Ravers vs Peaceniks - I must find out how to compile it and make it run on today's PCs! So glad this wasn't around in the 80s or 90s. You are right, Mike. 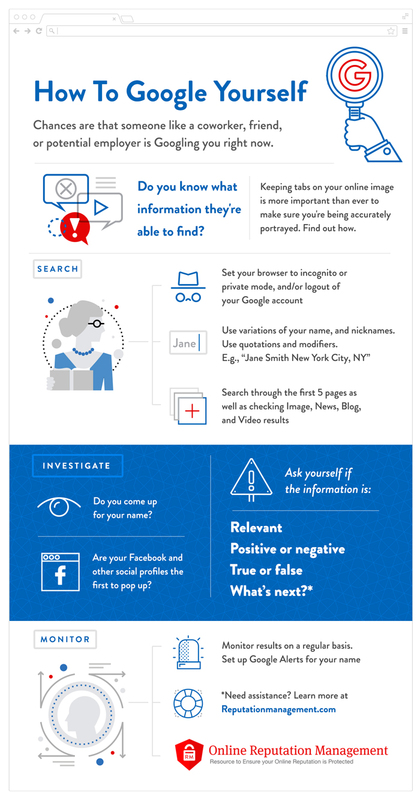 Being aware of online presence is key to getting a job & keeping one. Fun blog but a good message. This is step number one for so many employers now. So few young people understand how potentially damaging their social media accounts can be for certain career aspirations. Even seemingly harmless comments on political or social issues posted online, can come back to haunt people. Great post! Personally I'm ultra cautious about what goes on my social media profiles, especially Facebook - as a public sector worker I don't feel that ramming my political views down peoples necks is best practice, plus they're pretty boring to everyone except myself anyway!